Sponges Company, Sponge Processing - Polyurethane Expanded. We distribute to Householders, Retailers, Wholesalers, Car washers. Crosslinked Filters are applied in daily life very frequently. Have multiple uses: water filters in the pools or aquariums, dust filters for vacuum cleaners, air, oil filters for cars, trucks and motorcycles, filters to generate air conditioning. Research is focused on new polyurethane processes and products, inspired by the trends dictated by modern technology and society such as agglomerates. We manufacture products to meet specific customer needs. Multisint Srl resine espanse transforms sponge in Italy.We make various types of cut in square or shaped form. These types of machining are ideal for a variety of industries. Clients can choose an infinity of different raw materials by customizing their product. Multisint Srl presents the mattresses in Memory Anti-decubitus: Climatich Med, Massaggio Med, Luna Med, Multiplo Med, Delizia Med, Ondina Med, are 6 products that have obtained the Certification as Medical Device CE from the Ministry of Health..
We are looking always and only the highest quality and certified products, which is why we demand a lot from ourselves and from our suppliers. We choose with scrupulous attention raw materials purchased in Italy or Europe. 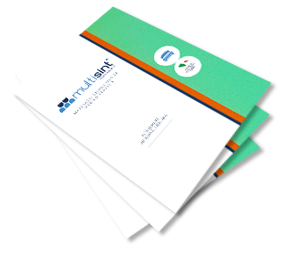 We have full control at every stage of processing in order to feel confident of delivering the best quality. Our range has been enhanced to provide our customers a complete service with accessories and mattress accessories: knits, shells, cover, mattress covers, springs, spacers, tapes and ribbons for edging, flat or rounded handles, pom-pons, packaging , networks, mechanical needles, hand needles. is one of the synthetic materials in versatile cells, belonging to the family of conventional polyether, it is the right combination of high performance, reliability, since the low density. 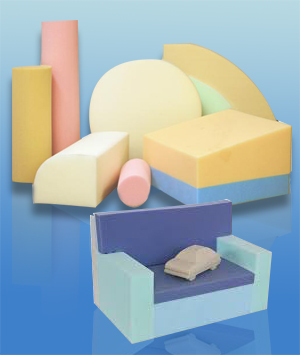 The polyurethane foam is processed with different techniques to obtain forms and shapes, to be used in different market sectors. Straight vertical cutting of slabs in dimensions and thicknesses with conventional numerical control. Scope: fruit and vegetables, packaging, marine, upholstery, cables, bag factories, box factories, salottifici, materassifici, furniture, spallinifici, gyms. Shaped computerized cutting achieved by pantograph with the control. Cutting of cutter for the realization of shaped or squared of non-standard sizes and shapes. Scope: upholstery, navigation, gaming products, sofas. Straight cut through the compression of the plate by means of two specially shaped rollers. Scope: pillows, mattresses, soundproofed, stamping, packaging, sponges car wash and home, sponges for 'personal hygiene, protection for wine food. The die-cutting is the compression shearing in steel molds, drawings of small and medium size, maximum 5cm in height. Milling allows with certain plot can create bulges. Scope: caskets for jewelers, hat factories, exhibitors, make-up, protection for wine food. Create, work and produce in Italy means draw on the experience of high culture, care, quality, flexibility, innovation, manufacturing and processing of raw materials that allow us not only to rimanare competitive but also to continue to contribute in a fundamental way to success of Made in Italy, which has always distinguished us. 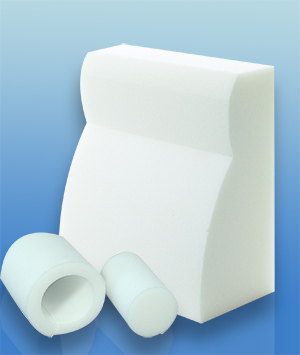 The polyurethane foam is a synthetic foam with open cells, more commonly known by the name of "sponge" or "foam". 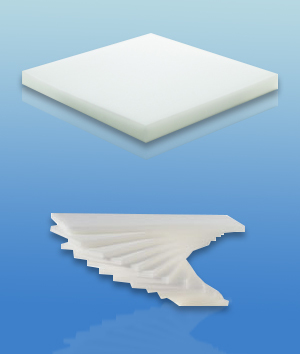 It is divided into two main categories: polyurethane foams based on polyether and polyester foams. The first are highly elastic, in cells completely open and with a good resistance to hydrolysis. They are available in densities ranging from 16 to 75 kg / cu.m. The second are foams with excellent absorption capacity to impact, with semi-open cell and with good resistance to organic solvents. They are available in densities ranging from 22 to 95 kg / cu.m. The surface may be machined smooth, embossed, pyramidal, punched and shaped. What kind of polyurethanes used? We provide a variety of polyurethanes to meet the demands of the customers, they differ for different density, hardness and elasticity of polyurethane. 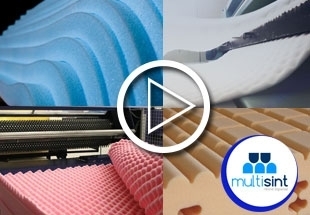 The polyurethanes used by Multisint are certified by the manufacturers to ensure products harmless and suitable for any use. . Each realization is based on the careful analysis of the dynamics of lending. Each product has its own characteristics: antibacterial, thermo-regulating ability, freshness, natural essences that combine with the polyurethane foam giving birth to a new generation of products designed to make trend by offering the opportunity to choose from a wide range of solutions finalizable, but also integrable between them. Polyurethanes can also be fireproof ampliamnte are transformed by Multisint, these characteristics for reaction to fire specially predetermined, according to national or international standards, to meet specific application requirements. Class according to UL 94 HF1. Memory is one of the most modern materials used in the preparation of a mattress. Originally used by NASA - American Space Agency to cushion and support astronauts in the presence of an 'intense gravity, was later processed and used in the processing stage of the mattresses. 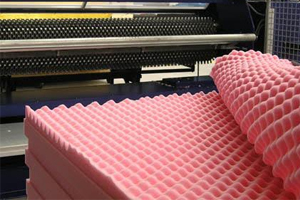 Consisting of a particular viscoelastic foam allows the mattress to fit with millimeter precision to the human body. Selfshaping and heat, the memory adapts its shape to the human body, for it combines perfectly with the rest of the polyurethane foam mattress. The weight is evenly distributed over the entire mattress so that there are no particular pressure zones that hinder blood circulation. The mattress returns slowly to its original shape after use. Our manufacturers are certified by OEKO-TEX, respond to European ecological standards, are free from substances harmful to health and exceptionally breathable; relaxing effect over water offer a sense of freshness and adequate support to the body, they are silent and sturdy. The duration of polyurethane products? The life of a mattress and temporal thresholds are purely commercial arguments in the absence of a serious comparative study on the durability. Some characteristics of the cushioning material can maintain longer the initial performance, with the same other conditions such as the density and the density ratio. The levels of compression of the polyurethane? The theme is closely related to the specific characteristics of the individual user. 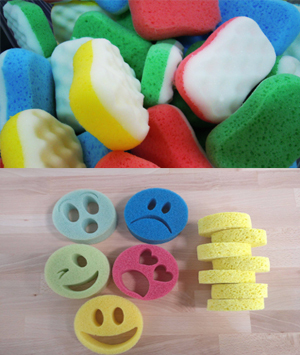 Those who prefer a soft material appreciates higher levels of crushing of the material, while those who prefer more rigid materials appreciates a sensation of "floating" on the foam, and then compression of the material very small. In all cases however, the crushing of the material, once distributed the weight of the user, it should not be particularly pronounced with respect to the total thickness of the slab because of the deformations of the mattress too pronounced may reflect negatively on the ability to properly support the human body. Multi-product obtained from the recovery of waste machining of polyurethane foam. It is a recycled material, available in various densities from 100 kg / m³ to 250 kg / cubic meter. Used for packaging in general, such as thermal and acoustic insulation in partitions in floors and ceilings. Where is employed acrylic fiber? Polyether fiber used primarily in the automotive, filtration, furniture, packaging and as a coating or insulation.